Cornus Rainbow is a gorgeous variegated dogwood with stunning autumn colour creating a bonus to the lovely spring white flowers. This White Flowering Variegated Dogwood has a dense upright habit (less spreading than other Cornus) with an abundance of white flower bracts in April or May. The leaves are green with gold margins in spring and summer, turning deep red/purple displaying scarlet margins in autumn, hence it's Rainbow name. This is a large shrub or small tree that will reach an esitimated height and spread of 3 x 3 metres in 20 years. Cornus Florida Rainbow grows well in good in sun or partial shade, and prefers a well-drained soil in a somewhat sheltered situation. 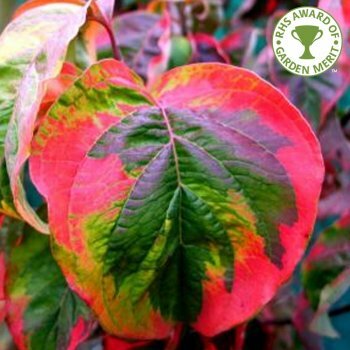 Our pot grown Rainbow Variegated Dogwood trees can be planted at any time of the year. Start by removing weeds and grass within a metre of your desired planting hole, then dig a square hole as deep as your root mass and roughly 1.5x as wide. To help the plant establish, sprinkle Mycorrhizal Fungi in the hole. If you’re planting Rainbow Dogwood in spring or summer, water well and regularly for the first few months. Take care to water the soil, not the leaves which can lead to scorching - irrigation kits make this easier. Increase watering in extended periods of hot or dry weather, but avoid over watering as Dogwood does not like wet soil. If you’re planting in autumn, you may only need to water a little. Once planted, keep the area free of competing weeds and grass for the first few growing seasons. Don't mulch around the base of Variegated Dogwood with bark. Most Variegated Dogwood trees naturally grow into an appealing dome-shape, so the only pruning required is to remove any damaged or diseased branches. The only time to hard prune a Dogwood tree is to control the overall size or internal canopy or if there is not enough light reaching the inner branches.